BRIGHTON, Mich - Ford's all-new F-150 features are taking the driving experience to a new level with improved comfort and convenience thanks to a dozen new technologies. America's most popular truck is debuting some features for the very first time and will maximize work and play activity. The notable lineup of tech-savvy features are aimed to help customers do more with their trucks. First, let's talk about visibility. The F-150 provides drivers with extra visibility thanks to a new 360-degree camera system. The first of its kind system allows the drive to view all four sides of the vehicle, providing easier navigation of parking spaces or around tight corners. Cameras are mounted in the grille, tailgate, and under each sideview mirror work together to provide the driver with a overhead bird's-eye view and perception for as much as seven feet of surrounding space. Energy-efficient LED lighting spreads throughout the interior and exterior of the F-150, making for a brighter, whiter light and improved durability than other incandescent lamps. Segment-first LED headlamps will give a better quality of light that is more representative of daylight colors. They also consume less energy than the average headlight technology and are designed to last the lifetime of the truck. The all-new F-150 also offers forward-facing LED spotlights on the sideview mirrors and LED cargo box interior lighting. The overall driver experience will be enhanced with a suite of smart driver-assist technologies that will be on the pickup for the very first time. Lane-keeping assist uses the front camera system to monitor lane markings and will also alert the driver if the vehicle drifts out of its lane. A complementing steering-torque features will pull it back into the center of the lane if needed. 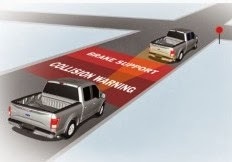 Adaptive cruise control uses onboard radar, automatically slowing the truck down when cruise control is engaged and the truck is approaching slow traffic. Once the slowdown is gone, the truck will resume the original cruise controlled speed. Collision mitigation is a system that use's the truck's radar to alert the driver if the truck detects a possible collision. The system can actually pre-engage the breaks to help the drive slow the truck even more quickly. BLIS®, Ford's Blind Spot Information System, with cross-traffic alert is a driver-assist feature that helps detect vehicles in blind sports during normal driving and traffic approaching from the sides when reversing out of parking spots. The F-150's cargo box has upgrading significantly, making it more versatile and driver-friendly. Remote lock/unlock of the tailgate and an automatic tailgate lowering feature that will lower itself with a push of a button on the key fob will be a huge help to customers. Stowable cargo ramps and lockable die-cast aluminum tie-down cleats, known as the BoxLink system, will help customers stow cargo in numerous ways. 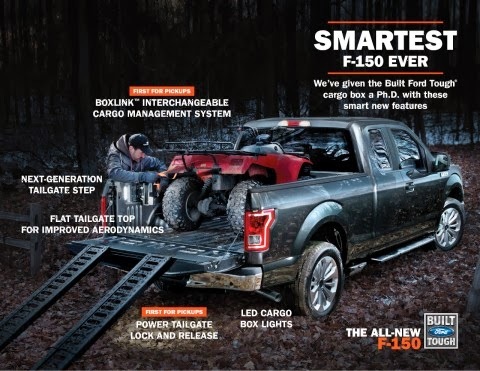 The F-150 SuperCab will also make it much easier to load and unload cargo with the flat load floor and rear doors that open almost 180 degrees. The all-new Ford F-150 features is taking the driver experience to a new level will the redesigned instrument panel as well. The panel features an all-new 8-inch productivity screen with computer-generated graphics and customizable information. The fuel gauge, tachometer, speedometer, and amp meter are computer-generated. Two available 110-volt 400-watt outlets are available in the dash and second-row center console in SuperCab and SuperCrew models. These new features on the all-new 2015 F-150 will alter the driver experience and advance it to an entirely new level. Honestly, what will Ford think of next? We're looking forward to seeing Ford and all of the outstanding vehicle's at the 2014 North American International Auto Show. Is there a Ford F-150 that you have your eye on? Visit Brighton Ford for the best selection in new, used, and pre-owned Ford vehicles. Our Dexter Used Car Dealership is happy to help those in Dexter and surrounding areas find the Ford they have been waiting for. With a huge variety of Low Mileage Used Cars, we guarantee you will walk away happy!